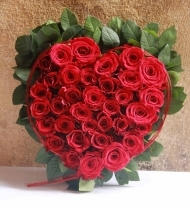 Valentine's Day - FloraDoor is top online florist in Egypt that specializes in getting your flowers to where you need them on time! Valentine’s Day is around the corner. Exactly one month away to be precise. Whether you are doing something special with your partner, buying flowers and a Valentine’s Day gifts for your secret valentine or celebrating the day of love with your fellow single friends, here are some fun facts for your entertainment. Every year about 1 billion Valentine’s Day cards are exchanged in the USA. This places it in second place, next to Christmas, as the largest card-sending occasion of the year. Teachers receive the most Valentine’s Day cards. Children come in close second and thereafter mothers, wives, sweethearts and pets. Yes, you read right, pets. And while we’re on the subject of pets, about 3% of pet owners will give Valentine’s Day gifts to their pets. Women seem to be the keenest on buying valentines seeing as 85% of valentines purchases are made by women, but they favors gifts other than flowers because 73% of all flowers bought on Valentine’s Day are bought by men. Each year on Valentine’s Day, more than 50 million roses, the majority red, are bought. The only other holiday that comes close to that number of flowers being given is Mother’s Day. The expression “to wear your heart on your sleeve” actually has a very literal origin. In the middle ages single men and women drew names from a bowl to see who their valentine would be and they would then pin this name on their sleeve. In the late 1800’s the first Valentine’s Day candy box was designed by none other than Richard Cadbury. Applause for the clever guy! On Valentine’s Day in 1876 Alexander Graham Bell applied for his patent on the telephone.